Our Site is neither directed to, intended for, nor designed to be used by anyone who is less than 18 years of age. You represent that you are at least 18 years of age. We do not collect personally identifiable information from anyone we actually know is a minor under the age of 13. If we receive a complaint which states that a user is under 13 years of age, we will comply with the requirements of the Children's Online Privacy Protection Act of 1998 ("COPPA"). We may collect personal identification information from adult Users in a variety of ways, including, but not limited to, when Users visit our site, register on the site, place an order, respond to a survey, fill out a form, and in connection with other activities, services, features or resources we make available on our Site. Users may be asked for, when appropriate, name, e-mail address, mailing address, phone number and credit card information. Users may, however, visit our Site anonymously. We will collect personal identification information from Users only if they confirm that they are over 18 years of age and voluntarily submit such information. Users can always refuse to supply personally identification information, except that it may prevent them from engaging in certain Site related activities. We may collect information in the form of website server logs ("Logs"). These Logs are files that record activity on the Site and gather statistics about users' activities, such as: (1) how many users have visited the Site; (2) how often; (3) how many "hits" the Site and a particular webpage has received; (4) sign-in and sign-off times for the Site; (5) type and quality of the user's Internet connection to the Site; (6) identification of the user's hardware and software accessing the Site; (7) the features on the Site you used; and, (8) the frequency of use. The entries comprising the Logs contain IP addresses, user IDs, and identification of the Internet service provider that provides your connection to the Internet. Generally, we use the Logs to operate and improve the Site, to identify the popularity of certain features, to assist with internal marketing and demographic studies, to enable us to assess overall efficiency and activity on the Site, and to assess users' web-browsing activities, preferences, and habits. We also use the Logs to monitor traffic on the Site and to troubleshoot technical problems.
" To personalize user experience: We may use information in the aggregate to understand how our Users as a group use the services and resources provided on our Site.
" To process transactions: We may use the information Users provide about themselves when placing an order only to provide service to that order. We do not share this information with outside parties except to the extent necessary to provide the service.
" To send periodic e-mails: The e-mail address Users provide for order processing, will only be used to send them information and updates pertaining to their order. It may also be used to respond to their inquiries, and/or other requests or questions.
" To send periodic Newsletters or Alerts: We may use information we collect from you to provide you with newsletters, alerts, special offers, promotional offers or market research surveys by e-mail, and we may maintain separate e-mail lists for different purposes. If you wish to end your e-mail subscription from a particular list, you need to follow the instructions at the end of each e-mail message to unsubscribe, or "opt out", from the particular list. Our opt out or unsubscribe process impacts only the future delivery of electronic mailings disseminated by us on our own behalf. 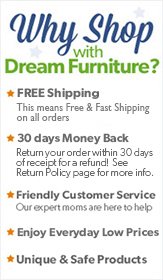 If you do not want Dreamfurniture.com to send you communications such as newsletters, announcements, or promotional offers, you may opt-out from receiving these communications at the time your Personal Information is originally collected through the communications preferences in your Account management page. Or, if you'd like to opt-out at a later date, opt-out instructions as well as instructions to update communications preferences will be included in the bottom portion of each e-mail we send to you. You may also contact us by regular mail at the address listed below. Please note that you may not opt-out from certain transactional or relationship messages (e.g., billing matters, Account reminders, legal updates) concerning your Account or products or services that you purchase from Dream Furniture or that you use on the Site. We adopt appropriate data collection, storage and processing practices and security measures to protect against unauthorized access, alteration, disclosure or destruction of your personal information, username, password, transaction information and data stored on our Site. Sensitive and private data exchange between the Site and its Users happens over a secure sockets layer ("SSL") secured communication channel and is encrypted and protected with digital signatures. We expressly reserve the right to disclose Personal Information and any other information to third parties if we believe, in good faith, that we are required to do so by applicable law, including, but not limited to, disclosure to law enforcement or other government officials in connection with an investigation of claims of fraud, misappropriation or infringement of any intellectual property rights or other proprietary rights, or any other conduct or activity that is illegal or that may subject you or Dream Furniture, its agents, employees, affiliates or others to any potential legal liability or as otherwise required by law. We may also disclose Personal Information and any other information where necessary for the establishment, exercise or defense of legal claims or as otherwise permitted by law. We reserve the right to disclose the Personal Information or any other information of a user who we believe is in violation of any policy or rule as posted on the Site, even without a subpoena, warrant, court order or other governmental request. In the event of a sale, merger, liquidation, dissolution, or transfer of substantially all of the assets of Dream Furniture ,the Personal Information and/or other information collected about you from the Site may be sold, traded, assigned or transferred to the party acquiring all or substantially all of the equity and/or assets of Dream Furniture, in order to permit the party to continue the operation of any acquired assets. You consent to the sale and transfer of your information as described in this paragraph. If the successor entity intends to use your information for a purpose unrelated to that which it was originally collected, we will contractually require the successor entity to provide you with notice of these new purposes and an opportunity to consent to such new purpose. Persons who are at least 18 years of age are permitted to register for an Account as set forth in the Terms of Service, Section 3 (Eligibility). If Dream Furniture becomes aware that any Minor is submitting or has submitted Personal Information to the Site without parental consent, we will close the Account and delete any Personal Information within our control as soon as possible. In addition, for purposes of the Children's Online Privacy Protection Act ("COPPA"), Dream Furniture makes the following statement: The Dream Furniture website is not directed to or intended for persons under the age of 13. If Dream Furniture becomes aware that any person submitting Personal Information is under the age of 13, we will close the Account and delete any Personal Information within our control as soon as possible. California Users may request further information about our compliance with this law by e-mailing: [email protected] Furniture. Please note that we only are required to respond to one request per user each year, and we are not required to respond to requests made by means other than through this e-mail address. Copyright 2014 by Dream Furniture Inc. All rights reserved.